Finding a great value for the money chainsaw on today’s market seems much easier said than done, but when you include the likes of the TimberPro 62cc 20” Petrol Chainsaw in your prospective list of options, things get much more interesting. The Timberpo saw is currently unavailable on amazon, and it's not clear if it will become available any time soon. There are some similarly priced alternatives available which you can find here. In this review, we’ll be taker a closer look at this heavy duty chainsaw which is capable of tackling just about any wood-cutting task around the yard. Want to know why we reckon this might be one of the most user-friendly chainsaws on the market today? The Timberpo saw is currently unavailable on amazon, and it's not clear if it will become available any time soon.There are some similarly priced alternatives available which you can find here. What Kind of Cutting Equipment Does the TimberPro Come With? What safety features can be found on the TimberPro petrol chainsaw? What are the TimberPro saw’s Dimensions? What Accessories do You Get With the 62cc TimberPro? What are the Pros of the Timber Pro Chainsaw? What are the Cons of This chainsaw? Made with a powerful 62cc engine, the TimberPro 20” Petrol Chainsaw delivers up to 3.6 horsepower, and for its price range, this chainsaw goes above and beyond the call of duty when it comes to completing basic cutting jobs such as bucking, limbing trees, and felling. Since the TimberPro chainsaw is capable of chopping up an 18-inch thick log in a simple, single pass, it’s possibly one of the best power cutting tools you could ever invest in. Unlike many other gas-powered chainsaws, the TimberPro Petrol Chainsaw has a unique startup procedure, but it’s so easy to master since there are loads of videos on the web which show you exactly how to get the machine up and running. To make things even easier, this chainsaw’s starting mechanism is power assisted. An automatic oiling system ensures constant bar and chain lubrication - no priming necessary. Fill fuel and chain oil tanks respectively, and tighten the caps securely. Set the switch to “I” position. Pull out the choke knob to the closed position. If restarting the engine immediately after stopping it, leave the choke at the open position. While holding the saw unit securely on the ground, pull the starter rope vigorously. When engine has ignited first, pull the throttle leaver to return the choke knob to the open position and then pull the starter again to start the engine. Allow the engine to warm up with the throttle lever pulled slightly. After starting the engine, run the chain at medium speed and see if chain oil is scattered off as seen in the image below. Note that the chain oil flow can be adjusted by inserting a screw driver in the hole on the bottom of the clutch side. Adjust according to your work conditions. When compared to other chainsaws such as Husqvarna or Stihl, the TimberPro has a much shorter pull. Keep in mind that first-time users definitely need to take the tips and tricks for starting this chainsaw to heart as some users have complained about snapping the starter because they weren’t clear on the chainsaw’s startup procedure. We like the fact that this heavy duty chainsaw is relatively easy to handle (for its size and capabilities), and as a bonus, the TimberPro comes with a set of dog spikes, which makes bucking and felling that much easier to get out of the way. Thanks to the TimberPro chainsaw’s anti-vibration dampening springs, the tool is comfortable to use and has minimal vibration during use, although we wouldn’t go as far as to say that you should use it without gloves though, as with any chainsaw, you should always make sure to use the appropriate protective equipment at all times. When it comes to performance, the TimberPro shines thanks to its carburetor anti-freeze mechanism, which rules out a slack on performance whenever temperatures drop below 5°C. This is an especially handy feature for winter-time use. We only had one minor issue with the TimberPro 66cc 20” Petrol Chainsaw, and that was the fact that it doesn’t exactly perform top-notch when it has been working for prolonged periods of time. Some users have also reported that they were unable to operate their saws as soon as its temperature surpassed the 40°C mark. This setback might be caused by vapor lock, which happens when the fuel delivery system gets overheated, and the gas evaporates too quickly. The problem quickly sorts itself out after the saw has been left to cool down for a while, but this is something that you’ll have to keep in mind before purchasing the TimberPro. The TimberPro 66cc 20” Petrol Chainsaw has (as the name implies) a 20-inch bar and comes with two chains. Because the bar features a sprocket on its nose, it allows for the chain to easily move around without losing too much power or heat. With the nose socket fitted to the bar, you’ll have to take care of your chainsaw by being meticulous about greasing the tip of the bar before use. If you’re keen on cutting grittier wood under dirtier conditions, we highly recommend you invest in the aftermarket bars without the sockets, also known as hard nose bars. Hard nose bars are, for the most part, specially designed to be used under more abrasive conditions. They work well for applications where treated wood has to be cut in large quantities. For regular wood cutting, sprocket nose bars are more efficient than hard nose bars, but the sprocket bars wear quickly at the tip of the replaceable nose. As far as the TimberPro chainsaw’s actual chain goes, it features 76 links with a 0.058-inch gauge and a distance of 0.325 pitches between links. Since the distance between the links is relatively short, you may not be able to cut as fast as you would have been able to with a 0.375-inch chain, but for small to medium-sized cutting applications, this chain will work perfectly well. One of the issues we have with the chains (included with the chainsaw) is the fact that they’re made in China, which obviously means that they’re not top quality. These chains are known to stretch and, in rare instances, become loose during cutting procedures. If you’re not planning on immediately replacing the chains with better quality ones, you can always consider soaking the chains in chain bar oil before using them for the first time. This should prolong their lifespan and help them resist stretching out. Being a traditionally shaped chainsaw, the TimberPro has a big orange power unit and features a handle at the front (wraparound) and back. 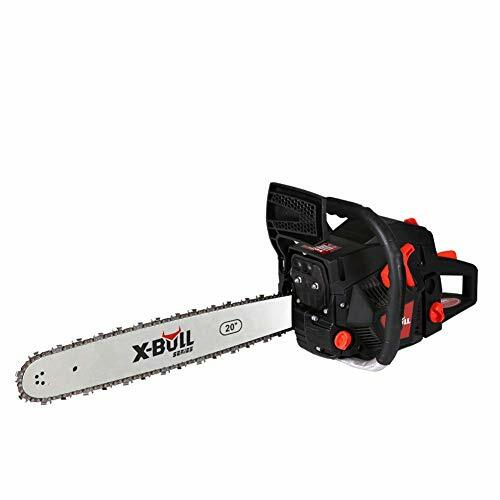 For added safety, the chainsaw has a user presence switch at the top of its rear handle, which might be very handy in the case of a grip-loss occurring while using the machine. Because the On / Off button is placed next to the rear handle, the TimberPro also has a choke (used for starting up the machine) located on the opposite side of the On / Off button. With a casing made of hardened plastic, the TimberPro isn’t exactly the most durable chainsaw out there, and it’s not going to be happy with being tossed on the back of your pickup, unlike other chainsaws that are fitted with metal casings. Although the plastic casing might be a downer when it comes to durability, it makes up for it by reducing the machine’s overall weight. This all works together to help make handling the machine that much easier. All in all, the TimberPro is a robust chainsaw, and although it might not be as superiorly constructed as many of its competitors, it’s almost three times cheaper than its closest competitor and provides a much more comfortable user experience than its heavier counterparts. Powered by a 62cc air-cooled, two-stroke engine, the TimberPro chainsaw will easily put out up to 3.6 brake horsepower, which is a lot for a machine in its price class. While normal home-use chainsaws come equipped with 35cc or 45cc engines, this one is a force to be reckoned with. This saw has to run on a fuel mix of 25:1, being 25 parts gasoline and one part two-stroke oil. Because it has a much larger engine than most other chainsaws of its caliber, the TimberPro can and will take care of heavy duty tasks, but that also makes it much less fuel efficient. The manufacturer doesn’t make any radical claims about fuel efficiency, but when you put this machine to work, it can easily work through a full tank of petrol in a mere 20 minutes. One other thing that you should keep in mind is the fact that the TimberPro, just like other gas-powered saws on the market, is pretty loud when in use. With the ability to reach a noise level of 117db, the TimberPro can easily leave you feeling like you booked front-row tickets to a rock concert, which is why proper ear protection is vital when using the saw. Moving on to the oil tank of the engine - the reservoir doesn’t have an inspection window for monitoring oil levels, which means that you’ll have to check that the oil level regularly. The oil tank has a maximum capacity of 260ml. Luckily you don’t have to flick a switch every time you use the machine to release oil when the blade is running; the TimberPro has an automatic lubrication system, which is a bonus. In addition to this feature, this saw comes with an adjustable chain oil screw, which is positioned on the saw’s underside. This screw comes in handy when you want to reduce or increase the amount of oil that is released during operation. Safety is one of the most important aspects when it comes to the overall user satisfaction of a chainsaw, and as one would expect, the TimberPro comes with a range of quality safety features to keep everyone (including the machine) safe and protected. One of the most noteworthy safety features of the TimberPro is its chain brake, which stops or activates the chain’s rotation if kickback happens during the cutting process. Then there are the dig spikes (or bumper spikes) which also help add stability and support to the saw while it’s cutting. As mentioned earlier, the TimberPro chainsaw is equipped with a user presence button at the rear handle, which will help keep you safe in the unlikely event that you lose your grip during the cutting process. Weighing in at 5.7kg, the TimberPro power unit is relatively lightweight. Its total weight (with the bar and chain fitted) comes in at just over 6.8kg. When compared to most other gas-powered chainsaws on the market, it’s very light for its capabilities. When it comes to the chainsaw’s size, the TimberPro has a bar which measures in at 35 inches long, 10 inches wide, and 11 inches high. The great thing about purchasing a TimberPro chainsaw is the fact that you’ll also get a bunch of cool accessories as part of the package. Because the TimberPro 66cc 20” Petrol Chainsaw is priced just right, is easy to start, features a very powerful engine, and can be compared to many of its competitors when it comes to performance, we reckon that this is an excellent option for first-time chainsaw buyers. When it comes to tackling larger projects in and around the year, the TimberPro chainsaw’s wide cutting and mighty engine will do far more than just perform the average task; it’s a tool which has been made with top performance in mind. Having considered all of its pros and cons, this might be one of the best power tools that money can buy, and to make things even better, this chainsaw won’t break, making it a win-win deal all the way. You can check amazon.co.uk for spare parts. Do you know where I can get the starter assembly for this chain saw. I can’t find it anywhere. Thanks.